I recently read and was very impressed by “The Tao of Pooh and Te of Piglet” by Benjamin Hoff, 2 fable-style stories in which Hoff uses Winnie the Pooh and the other characters from A. A. Milne’s stories to explain in simple terms the basic principles of philosophical Taoism. 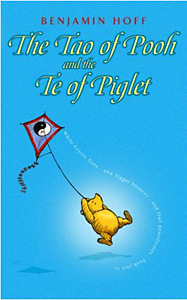 Pooh’s Way of doing things seems strangely close to the ancient principle of Taoist philosophy, while Piglet exhibits the very important principle in Taoism of the Te, meaning Virtue of the Small. The author’s explanations of Taoism and Te through Pooh and Piglet show that this is not an ancient and remote philosophy but something that you can use, here and now. Amazon.com Review – Is there such thing as a Western Taoist? Benjamin Hoff says there is, and this Taoist’s favorite food is honey. Through brilliant and witty dialogue with the beloved Pooh-bear and his companions, the author of this smash bestseller explains with ease and aplomb that rather than being a distant and mysterious concept, Taoism is as near and practical to us as our morning breakfast bowl. Romp through the enchanting world of Winnie-the-Pooh while soaking up invaluable lessons on simplicity and natural living. Library Journal Review (Jeanne P. Leader, Western Nebraska Community Coll. Lib., Scotts Bluff) – Author/narrator Hoff calls Winnie the Pooh a “Western Taoist” and uses the unassuming bear to introduce Eastern philosophical principles. Pooh epitomizes the “uncarved block,” as he is well in tune with his natural inner self. Pooh enjoys simple pleasures and the daily progress of life. Hoff contrasts this unpretentiousness to other characters created by Winnie – the – Pooh author A.A. Milne, including Owl, whom he describes as a “mind that tries too hard,” and Eeyore, the eternal pessimist. In a clear and crisp voice, Hoff explains the central tenets of Taoism and further illustrates them with familiar excerpts from The House at Pooh Corner stories (1923), Chinese proverbs, maxims, and tales from Lao Tzu and others. The result is at once thought-provoking and charming. This is a small literary event that will leave all who experience it a little more serene. For most collections. When you discard arrogance, complexity, and a few other things that get in the way, sooner or later you will discover that simple, childlike, and mysterious secret known to those of the uncarved block: life is fun … From the state of the uncarved block comes the ability to enjoy the simple and the quiet, the natural and the plain. Practically speaking, if time saving devices really saved time, there would be more time available to us than ever before in history. But, strangely enough, we seem to have less time than even a few years ago. It’s really great fun to go somewhere where there are no time saving devices because, when you do, you find that you have lots of time. Elsewhere, you’re too busy working to pay for machines to save you time so you don’t have to work so hard. Sounds pretty interesting book. Have you read it? I may go to the local bookstore and buy it. I always like to read books in my spare time. Sounds like a good read. Like the philosophy. I love to read your short post on Pooh and Piglet here buddy. The Tao of Pooh could inspire us in many of life aspects. Thanks for sharing your thoughtful ideas. Hi buddy..I love to read your short post on Pooh and Piglet here buddy. The Tao of Pooh could inspire us in many of life aspects. Thanks for sharing your thoughtful ideas. I loved this book. It was one of those that really did an excellent job conveying some very deep thoughts in a meaningful way. I highly recommend it as one of the must-read books of the year.